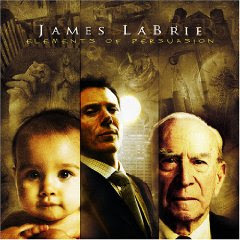 Review: James LaBrie, "Elements of Persuasion"
Surprisingly, the first thing you notice about the latest solo album from Dream Theater frontman James LaBrie is not the vocals. In fact, it's the huge guitar riffs of Marco Sfogli. While the album is LaBrie's opportunity to pursue some things that wouldn't fly in the Dream Theater setting, it's Sfogli who steals the show with chunky riffs that are the stitching for this progressive metal Frankenstein. For a guy who, on his Web site, claims to be influenced by Toto, the Police and (unfortunately I’m not kidding) Winger, Sfogli lays down some pretty solid heavy licks. As is often the case with solo albums, "Elements of Persuasion" doesn't fall too far from the Dream Theater tree. In general, it's a bit heavier with a bit less emphasis on the prog elements. Think about the heavier parts of a song like "Pull Me Under," and you've got a pretty good idea of the tone of the album. While not exactly Dream Theater-style songs, numbers like the chugging "Freaks" and "Undecided" certainly wouldn't turn anyone's head if they showed up on a Dream Theater album. But LaBrie has a few tricks up his sleeve, starting with the opening tracks of the album. "Crucify" gets things going with a blast of classic Metallica-style thrash. It’s a good song, though LaBrie’s voice isn’t ideally suited to the style. On the second song, “Alone,” LaBrie veers into a techno-metal romp that, despite the use of drum machines and turntables, will still appeal to fans of Dream Theater’s style of prog metal. The band even strays from the rock path completely on the fusion-inspired "Lost," which shows off the rhythm section of Mike Mangini and Bryan Beller. It’s when things slow down that the album falters. Ballads like “Smashed” and “Slightly Out of Reach” drift a little too far into commercial waters for my tastes, with the latter sounding almost like it could come from a Winger album (with better vocals, of course). The slower songs suffer from a serious lack of the album’s strongest element — Sfogli's guitar. Better to skip them and blast “Oblivious” or “Invisible” as loud as the stereo will crank. What LaBrie does well on this album is tap into the pure rock elements of his main band while scaling back on the artsy parts. He leaves just enough of the progressive sound to please Dream Theater fans, but also opens the door for listeners who are fans of traditional metal. This is an impressive solo effort for LaBrie, who shows that he’s capable of breaking out of his regular band. But when all is said and done, it's Sfogli that you’ll really want to hear more from. In the 1980s thrash scene, you had the "big four" - Metallica, Megadeth, Slayer and Anthrax - and you had a ton of smaller bands that were also pretty good, but didn't get the press. One of those was Overkill. Unlike some of the others, Overkill has survived, and even thrived over the years. Their 1999 album "Necroshine" was perhaps the best of their career, putting the focus on big riffs and memorable hooks instead of the raw speed and aggression of their early albums. On "ReliXIV," the band tries to serve both masters, with some success. While some of the speedsters like "A Pound of Flesh" fall flat, old school thrashers like "Keeper" show the band locked into its groove. While other thrash bands tried to evolve into something else over the years, the members of Overkill, like Slayer, know what they do well and they deliver every time. The strongest songs on the album, "Loaded Rack" and "Bats in the Belfry," provide a blueprint for what thrash should be. But the band also takes the chance to have some fun on the campy "Old School," which sounds like a cross between Motorhead and the Ramones. I defy anyone to listen to this song twice and not get it stuck in their head. 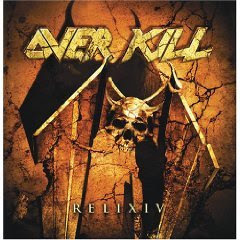 As usual, Overkill doesn't deliver anything new, but they also don't disappoint fans of classic thrash. 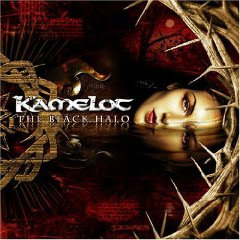 All I can say is, "Here's to the old school/didn't matter if you looked cool..."
Review: Kamelot, "The Black Halo"
In the power metal genre, there are few bands that have been as consistent as Kamelot over the course of the past 10 years. They entered the scene with a solid debut, "Eternity," in 1995, but they became one of the top bands on the scene with the addition of vocalist Roy Khan for 1998’s "Siege Perilous." Since then, each album has been better than the one before it, and that’s something I don’t say about too many bands. "The Black Halo" continues their adaptation of Johann Wolfgang von Goethe’s "Faustus," which began on their last release, 2003’s "Epica." On this album, the story takes a darker turn, and so does Kamelot’s music. The mood hits immediately on the opening track “March of Mephisto,” which features the snarls of Dimmu Borgir vocalist Shagrath, who appropriately provides the voice of Mephisto. Stratovarius keyboard player Jens Johansson also lends his talents to the track in the form of some ethereal Rush-like synth work. Other guests on the album include Simone Simons of Epica and Mari of Masqueraid. Unlike so many power metal bands, Kamelot is not obsessed with speed. If they need the speed, it’s there, as you can hear on tracks like “When the Lights are Down” and “Nothing Ever Dies,” but those are really the only two tracks on the album that you’d consider traditional power metal. The rest are a combination of more traditional melodic metal and prog stylings. In fact, the middle portion of the album rarely gets above mid-tempo, beginning with the moody “The Haunting (Somewhere in Time)” and continuing through the eighth track “Moonlight.” Most striking in this stretch is perhaps the piano ballad “Abandoned,” with its soft orchestration. It’s a very understated performance for a genre known for its bombast. The album returns to the power metal realms with a huge riff on the title track. But the centerpiece of the album is the epic “Memento Mori,” which finishes the concept, though it’s not the last song on the album. Clocking in at just under nine minutes, it’s the longest song in the history of the band. The track takes the listener on an emotional journey from the bleak, melancholy passages through angry thrashing riffs and finally into resigned acceptance. The most impressive thing about the album, though, is not the incredible guitar work, the atmospheric keys or the amazing vocals. It’s the sound quality. So often, power metal albums sound thin and reedy, with too much focus on the guitar and vocals and not enough on the music as a whole. Kamelot draws heavily on classical and symphonic sounds, and it shows in the production of "The Black Halo." The album sounds just like a well-mixed and produced symphony with the emphasis all in the right places. Even if you’re not a fan of power metal, this album sounds so damned good it might make you one. Kamelot may not be one of the most recognized names in the metal world, but when it comes to melodic metal, there are few bands out there right now that do it better.